Apple’s iBeacon™ technology is built into our EventPilot conference app and is available as an add-on module in all of our editions. The Location Alerts module allows meeting professionals to set up notification messages that are not just timed, but are triggered if the attendee is in a particular location at your venue. GPS locations are ideal for large areas such as your entire conference venue, the city, or the airport. Beacons are great for indoor locations. Send relevant messages in areas where attendees will be spending some time and can receive the beacon transmission. For example, waiting in line at the registration desk, standing by the membership desk, sitting in the attendee lounge, or waiting for the bus in front of the conference center. You can use one iBeacon for multiple alerts within the app, for example, on the first day of the event it could trigger a welcome message, on the second day a reminder about the reception, and on the last day a request to complete the conference survey. USB beacons can be plugged into any computer or monitor with USB port or any other available power source using a little USB adapter. Since you can plug these beacons in, they can be reused in the future without having to swap out batteries. You can purchase beacons from our partner Radius Networks. The iBeacons themselves simply transmit their own identifier number, called UUID. Your beacon’s UUID is registered with your specific EventPilot implementation to trigger your message. 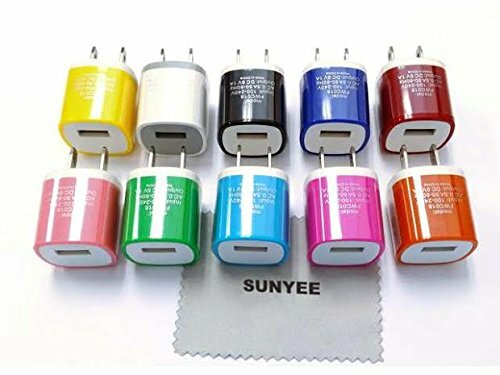 Organize your USB-beacons using colored USB power adapters. Thank you Jason from BSC Management for this great tip! What are your ideas for using beacons or GPS to trigger messages at your event?